The primary purpose of the SLBC Children’s Ministry is to come along side parents and help reinforce, nurture and develop the faith of the children of our congregation, teach God’s Word, and to focus on the Great Commission of Jesus Christ (Matthew 28: 19-20). We will accomplish this through an environment that helps build a biblical worldview and teaches God’s Word. With the Lord’s help, we are committed to assisting parents in equipping their children to be confident in what they believe and able to defend their faith in love, boldly and unashamedly. SLBC’s 2018 VBS was a success! Praise the Lord!! Check out all the fun. SLBC is excited to present one of our newest resources, FreeGraceKids curriculum! The majority of this curriculum is derived from the teaching material found in Charlie Clough’s Bible Framework series. 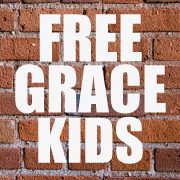 However, FreeGraceKids packages its concepts into understandable terms for children and young adults. Its aim is to provide a resource for Biblical curriculum with a dispensational perspective. Nursery aged children (infants and toddlers) are cared for by church volunteers and paid workers. All volunteers and workers are required to have current background checks on file in the church office. The infant nursery is equipped with a special room for nursing mothers. We welcome you to stay anytime to meet the needs of your new baby. Christ Centered – Every lesson shares the Gospel of Jesus Christ as our promise of salvation and the power of living. Bible Based – Students not only learn historical Bible accounts but are introduced to key doctrinal themes for a firm faith foundation. Life Directed – Hands on lessons and activities prepare students as they mature in character and in life, helping them put their faith into practice in all situations. Family Connected – Take home materials encourage faith-building that involves the whole family. Gospel Driven – As students continue to mature in age and character, sharing the good news with their friends and family also helps them put their faith into practice, particularly in relational situations. Family Connected – Take home materials encourage faith-building that involves the whole family. Activities are from 6:45 – 8pm. Kids‘ Club is a place where kids learn how to walk hand in hand with the Lord Jesus Christ. It is a place where learning about God is fun and exciting. Kids’ Club is the mid week (Wednesday) children’s ministry of Sugar Land Bible Church that serves four year olds through the 5th grade.